Relax for longer and enjoy a burn time of up to 140 hours with the large Marie Candle. Coconut Lime - The top seller. A luscious blend of fresh lime with creamy coconut. Vanilla and sandalwood notes complete this delicious scent. Lychee & Black Tea - A personal favourite, this scent is just a rockstar. The delicate aroma of black tea is complimented by the sweet, tart contrast of the exotic lychee. A bold and uplifting fragrance. Vintage Gardenia - An exquisite fragrance of tropical Gardenia, with a sweet and green top note and rich floral body. French Vanilla - A rich and sensual vanilla bean aroma. Jasmine - An exotic blend of freshly cut Jasmine flowers with a touch of honeysuckle. Sweet Orange & Chilli Pepper - A stunning scent with a light vanilla base enhanced with musk and citrus. Top notes of chilli and sweet orange. Ylang Ylang - They call this the king of all scents for good reason. Bold and exotic, this fragrance is everything - sweet, heady, floral and spicy. Lily of the Valley - A bold version of the classic floral fragrance. Pohutukawa - Experience this iconic NZ summer tree anywhere, anytime. Fresh and delicate floral notes combine with light woody tones to deliver a light Pohutukawa fragrance. 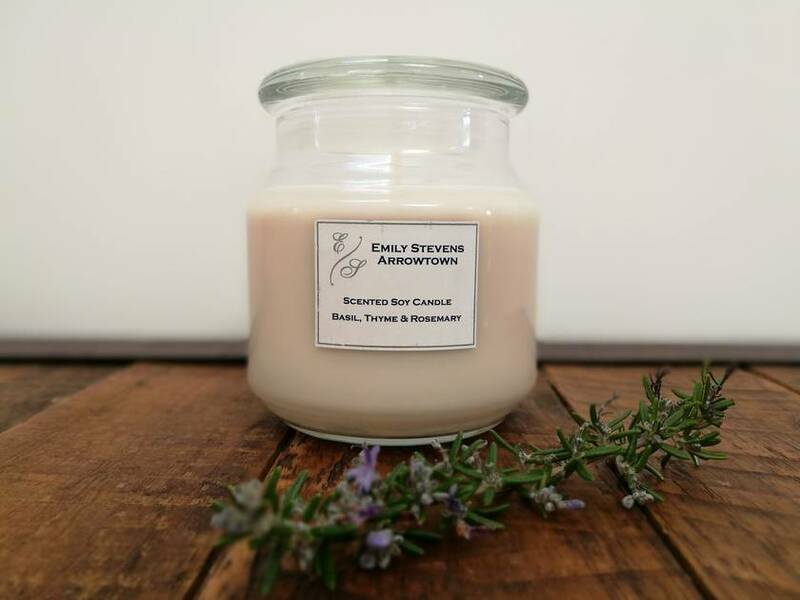 Basil, Thyme & Rosemary – Perfect for burning as your kitchen candle, this scent is natural and fresh. French Pear - One of the most popular fragrances that captures the natural sweet scent of French brandied pears. White Tea & Ginger - A refreshing scent with top notes of bergamot, lemon peek and daylily and a base of ginger, nutmeg and warm musk. Frangipani - A warm fresh floral scent to take you immediately to the beauty of a tropical island. Makassar Ebony & Peach - An exotic blend of peony, peach and makassar ebony wood. Christmas Pine - Nothing conjures up the feeling of Christmas better than the fresh cleansing smell of the Christmas tree. White Lavender Cotton - Herbal lavender is blended with fresh cotton notes and a hint of sandalwood to create this sophisticated blend. Fresh and cleansing this is a perfect scent for your laundry or bathroom. Strawberry - Ever popular scent that is sweet and fruity like strawberry pie. Mango & Papaya - An incredible delicious blend of tropical fruits. Rose - A classic and fresh rose scent. Pomegranate - A hint of light musk and creamy vanilla create a base for ripe pomegranate and fresh berries with sparkling citrus top notes. Contact emilys01 to enquire about payment or shipping options.